Nobody knows how lightning is formed. However, we are ever closer to an answer thanks to a revolutionary method to perform measurements inside a thundercloud. No one knows exactly how lightning is formed. It is indeed an electric discharge in a thunderstorm, but the electricity is not actually powerful enough for the initial spark. Particle physicist Olaf Scholten and PhD candidate Gia Trinh are attempting to unravel the mystery with a new method that uses the LOFAR radio antennae. They utilised the antennae to study high-energy particles. Some measurements were quite unusual: they appeared to coincide with thunderstorms. By listening to the radio signals from a thundercloud, you can measure the electricity without influencing it, which is what happens when measurements are taken by airplanes inside thunderclouds. That is revolutionary. Scholten and Trinh are hoping to provide evidence for one of two theories. Lightning is either formed because it creates a ‘needle’ from ice crystals, which increases the electricity, or the ‘spark’ is triggered by a high-energy particle. Scholten will also use LOFAR for a new project: studying the path the lightning follows from the sky. The radio antennae can measure the intervals down to 30 centimetres – currently, the closest measurement is 100 meters. It is one of those mysteries that you never even knew was a mystery to begin with. After all, we have long since stopped believing that thunder and lightning are caused by Thor, the god of thunder, throwing his hammer around. It is ‘merely’ an electric discharge inside a thundercloud. Right? That is the question he and his PhD student Gia Thi Ngoc Trinh are trying to answer with the help of a revolutionary method they developed by accident. The hundreds of LOFAR antennae that have been placed in the field around Exloo to listen to the stars are the basis of it. They look a little forlorn, the radio antennae. They have been placed in the middle of nowhere, with only leaping deer, geese flying past, sedge warblers, and larks for company. Their surroundings can get quite wet, so most of them are standing in large pools of water – especially during the winter and spring. This is Wellington country. It is hard to believe that these seemingly simple feelers are not just listening to the stars, but that they also pick up the radio signal produced by lightning. That is not even remotely what they were designed to do. What’s more, the research Trinh was initially using them for was also an unintended spin-off. She was studying the radio signal produced by the particle shower that is formed when a high-energy particle hits the earth’s atmosphere from space. It can be used to determine the height at which the shower reaches maximum speed, which then provides information about the origins of that very first particle. Thunderstorms are usually formed when there is a large difference between the temperature in the various air layers. Warm air close to the ground rises to great heights, cooling quickly. That forms both negatively charged ice particles and positively charged snow particles. The heavier ice particles drop down while the lighter snow particles rise up to the upper layer of the cloud. But the earth’s surface itself is positively charged. The difference causes a powerful discharge: lightning. Several intense calculations later, their assumption was confirmed. When a particle shower is travelling through a thunderstorm, the signal is bombarded by the strong electrical fields in the cloud. The polarisation, or vibration direction, is changed, which increases the intensity of the radio waves. And that data made it possible to create a fingerprint for a thunderstorm. ‘Besides, this data is much more exact than anything we were able to measure before’, says Trinh. These kinds of measurements are usually taken with weather balloons that are released inside the cloud. ‘But that balloon influences the electric field, as well as the measurements.’ The same goes for the planes who collect data by flying straight through a thunderstorm. Moreover, the LOFAR antennae collect much more data than a plane or balloon ever could. The feelers on the ‘super terp’, the beating heart of the telescope, are programmed to continuously collect and discard data. But when a particular trigger comes up – for example a pattern that coincides with the impact of a cosmic particle – LOFAR saves everything that was detected in the five seconds prior to that. This also happens when it coincides with a lightning discharge. It turns out that a particle shower usually shows a kind of kidney-shaped voltage pattern, but during a thunderstorm, that pattern becomes a perfect circle. It allows us to deduce exactly how strong the electric fields are at different heights in the thundercloud. When you think about lightning, you most likely imagine the forked flashes across the sky. But there are so many more electrical discharges, most of them taking place in the atmosphere. Sprites – Red flashes of light that are visible for several milliseconds above an active thunderstorm in the mesosphere, at a height of approximately 74 kilometres. Sprites can be seen in clusters and exist for a few thousandths of a second after an impact on earth. They were only discovered in 1989. Elves – Luminous rings that are visible for less than a millisecond. They sometimes form at a height of 90 kilometres after lighting flashes send a strong electromagnetic pulse into the atmosphere, and they can be up to 400 kilometres wide. Blue Jets – A blue, cone-shaped flash that is formed at the top of a thundercloud and is transmitted upward. Ball lightning – Mysterious lightning that can grow to the size of a football and is said to move straight through houses. One possible explanation is that ball lightning is actually an electron cloud, but such a cloud would not be able to sustain itself for several seconds. In 2000, researchers from New Zealand came up with the theory that ball lightning is formed because some impacts cause the formation of silicon, which takes on the form of a fuzzy ball. The glowing would be caused by oxidisation. Heat lightning – Lighting flashes taking place in the clouds themselves. During heat lightning, you can see the cloud itself light up. Besides, he is already working on developing even more tools. 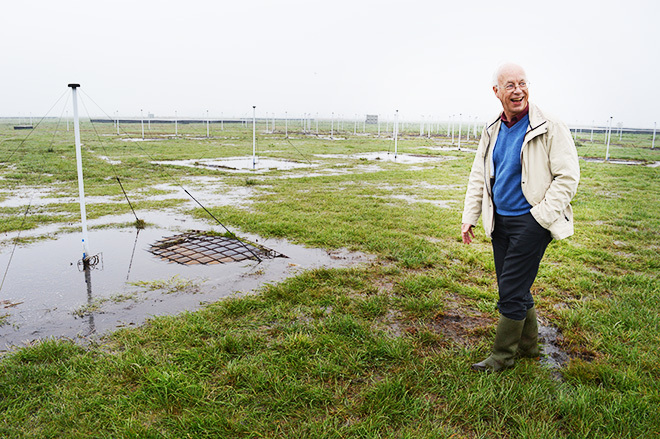 Because once Scholten realised that LOFAR can be used to study the very origins of a lightning bolt, he also knew that it would have to be possible to use the radio antennae for that other mystery: how does a lightning bolt move dozens of kilometres across the sky? Scientists are still clueless as to how the air that initially works as an isolator can suddenly become a conductor. ‘What we do know is that it doesn’t happen all at once’, he says. A bolt ‘walks’ across the sky in a jerky movement. Repeated, bright discharges either shoot into the atmosphere as ‘elves’ or ‘sprites’ (see box ‘Lightning’), bounce to and fro between the clouds or they hurtle downwards and hit the earth. And then there are the gamma and x-rays, too. Photo or video equipment is not yet accurate enough to properly record it. ‘Lightning travels dozens of metres in a nanosecond’, says Scholten. Currently, we have the ability to measure lightning every hundred metres. But by using the data from the LOFAR antennae that are set up in the 500 square kilometre area around the super terp, you can reduce that to just 30 centimetres. That would be an enormous improvement which could lead to great insights. And they are sorely needed. Lightning strikes cause great damage to electronic equipment, the discharges influence the climate and they damage planes. A better understanding of this natural phenomenon can increase safety and limit the damage.